Are you looking for a new bag for the summer? 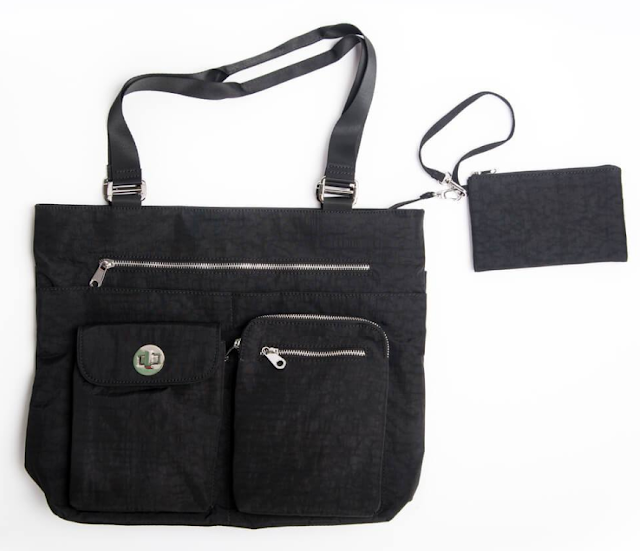 How about a great bag with pockets galore, a bag that would be wonderful for travel? If so, you are going to love the new bag from Therafit. This company is well known for their comfortable shoes, and now they sell a wonderful vacation and everyday bag, the Lexi Premium Tote Bag. Multi-pocketed, and using lightweight water-resistant nylon, the Thearfit Lexi Tote bag has thoughtfully designed compartments to hold all your essentials. 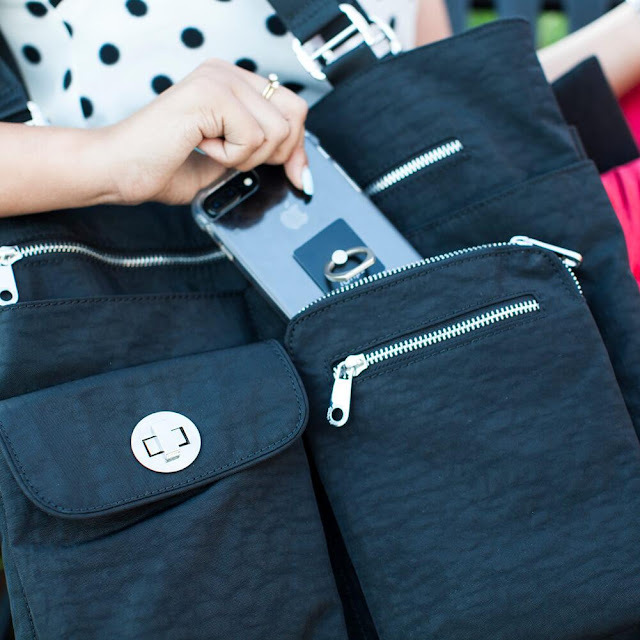 It even includes a secure outside pocket for easy access to your mobile phone, keys, and other important items. Secured with a zip top closure, the spacious interior will hold your larger items and comes with a removable wristlet. The Therafit Lexi Tote is perfect for travel or everyday use. Shoulder strap with a drop length of 11"
The Therafit Lexi Premium Tote Bag is lightweight, water resistant, fits across over the shoulder, has a great number of pockets and is roomy and the back pocket converts and will slide over the handle of your luggage. There are so many pockets! Wow! I know I will be using each and every one to organize, to me the more pockets the better! We'll be heading back to Disney World in August and now that my daughter is older and taller and a little braver she'll be taking the plunge and riding Splash Mountain. From what we've seen and heard you really do get soaked on Splash Mountain now, the last time we rode it we didn't get wet at all. Now that you get soaked once again I'd normally have to worry about my bag getting wet and possibly ruined. The Lexi Premium Tote Bag is made from lightweight nylon that is water resistant and will just laugh at Splash Mountain! The one thing I would love to be added to this bag is the ability to go across the body, other than that this bag is amazing! When you're going to a theme park you tend to want to travel light but inevitably you wind up taking enough things to go on a week-long excursion. The Lexi Premium Tote Bag can handle all I need to carry from a great airport bag, plenty of room for snacks, and magazines to pass the time, to a great everyday bag. Carrying the bag is simple and I will be comfortable doing it. 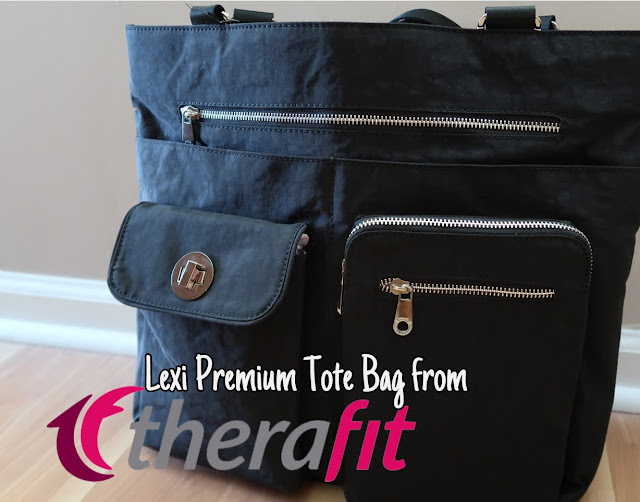 A great bag is important to have in your arsenal and if you need that bag to be able to handle many functions while being cute and useful and even water resistant then Lexi Premium Tote Bag from Therafit is just what you need! The generous folks at Therafit footwear are giving one of Susan’s Disney Family readers a chance to win a Lexi Premium Tote Bag from Therafit. Would you like to win? Please visit the Therafit site, take a look around then come back here and tell me something else you love from the site. There are also other ways to enter, please enter below. You can purchase these great sandals and much more please visit the Therafit site. Enter the code Blogger18 to save 10% off your purchase. I also love the Sydney sandals. I really like the CASSANDRA WOMEN'S FABRIC ADJUSTABLE STRAP WEDGE SANDAL. I like the Austin Women's Denim Clog Slip On in brown. The Cassandra wedge sandal is very nice and would be good for all kinds of outfits. I really like the "SYDNEY WOMEN'S ADJUSTABLE FLORAL LEATHER SANDAL". Jessica Women's Leather Adjustable Cross Strap Sandal in Blue Grey. I like the grey Rio Women's Ballet Flats. They are so cute and comfortable! I would love to own a pair of the SUMMER WOMEN'S FABRIC SLINGBACK SANDAL! I love that they have shoes to help with all types of foot and knee pain! I have crooked ankles and knees so I may try some to see if it can help with some of my pain! My wife loves the dawn Women's Slip On Active Shoe. I absolutely love the GRACE WOMEN'S LEATHER ADJUSTABLE SANDAL. I like the Rose Women's Leather Adjustable Strap Wedge Sandal. I like the HEATHER WOMEN'S INDOOR/OUTDOOR WOOL CLOG SLIPPER.